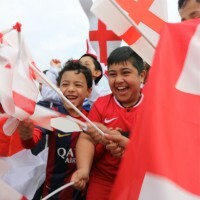 The England football team unites people of all races and faiths more than flags, St George’s Day or any other symbol of English identity, according to new research released today, one month before England competes in the Euro 2016 football tournament in France, writes Steve Ballinger. The findings are released to mark the launch of a new campaign called #WeAreAllEngland which aims to get people from all backgrounds in England to come together to celebrate our shared identity. Three quarters of the general public (74%) – and of ethnic minorities (74%) and Muslims (75%) – say that the England football team is a symbol of England that belongs to people of every race and ethnic background in England today, according to the Survation poll. That compares to much lower scores for other symbols of England, like the St George’s flag (all public 57%; BME 57%; Muslims 58%); a St George’s Day party (all 59%; BME 54%; Muslims 46%) or ‘calling yourself English’ (all 53%; BME 53%; Muslims 55%). The #WeAreAllEngland campaign will encourage thousands of people, from all faiths and ethnic backgrounds, to show their support for the England team by posting and sharing a picture of themselves supporting England, or doing their ‘England goal celebration’, on Instagram, Facebook and Twitter using the #WeAreAllEngland hashtag. The campaign is supported by Kick it Out, Facebook, the Islamic Society of Britain, Hindu Council UK, City Sikhs, Church of England Diocese of London, Jewish Council for Racial Equality, the Centre for English Identity and Politics at Winchester University, Eastern Eye, Abu Hanifah Foundation, Rich Mix, New Horizons in British Islam, Common Vision, Reform Judaism and the British Muslim Forum. When the England team runs out at Euro 2016 we’ll all get the flags out together and shout ‘Come on England’. But outside the stadium, we English can struggle to show the pride we all feel in our nation. Some people worry about whether they’re allowed to celebrate Englishness, while others aren’t sure if they’re invited to the party. There is no loyalty test here – just a chance for everyone who wants to join in to demonstrate that we can all show our pride, together, in the nation we are today. 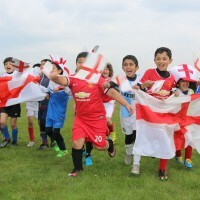 #WeAreAllEngland is a simple campaign to show how the England team brings us all together – and that England is at its best when we all feel we can belong to it. Join us by sharing a photo of your support for England with the #WeAreEngland hashtag across Facebook, Instagram and Twitter.